In BlueJ, you are able to interact directly with Classes and invoke their methods. However, a program in the real world runs without BlueJ, so it needs some interface for communication with the user. While many programs use a visual interface, it's simpler to use an all-text interface. We saw this previously when printing output, and we'll now see how to get the user's text input into the program with the Scanner class. This node will quickly cover the basics of Scanner, and you can refer to the official docs and the Learneroo Scanner reference for more information. The Scanner is used in Java to parse text input into useful pieces. Input can come from different sources, such as a text file. In this node, we will be getting input from the STDIN, or Standard Input. This is direct text input that comes into the program through the terminal. The terminal is where output is displayed when you type System.out.print and it can also be used to get input with System.in. This will cause the terminal to pop up and display the output "hello". 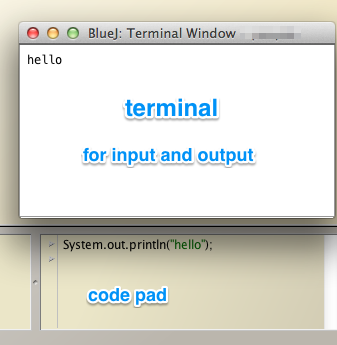 The terminal can also be used for typing in input, as will be shown below. Answer: It's a special Java class in the built-in java.lang package that has a few useful methods. You cannot create instances of System, but you can use its special fields System.in and System.out to access the Standard Input and Output. The Scanner will grab the first word typed ("hello") and assign it to word1. If you look at the methods of Scanner, you'll notice that many of them have similar names, like hasNextThing() and nextThing(). For example, there's hasNextInt() and nextInt(). The "hasNextThing" methods are used to check if the next token of text input is of type "Thing". For example, hasNextInt() tells you if the next token of input can be interpreted as an integer. The "nextThing" methods take in the next token and converts it to type "Thing". For example, nextInt() reads the next token and converts it to an int to return. If the next token cannot be converted to an int, nextInt() will throw an error. BlueJ do not want to compile "switch(input)" because input is String. What should I do ? If you're using Java 6, you should use an if-else statement instead. Is it normal to initialize your Notebook in a menu class? Should I put it somewhere else? Would it be smart to create an Initialize class? In this case I think it's fine. In a larger program it's true that it might make sense to create the Notebook separately.